Kelly Lance, a 49-year-old endurance runner from Pocatello, climbed all of Idaho’s 12,000 foot peaks, known as the 12ers, in a 119 mile, 78-hour push starting on September 2, 2017. Unlike the others who have climbed the 12ers in a single push, Kelly did it without resorting to mechanized transportation, the first traverse of its kind and perhaps the most over-the-top accomplishment on these peaks to date. This story is all about endurance, planning, training and determination but in the final analysis it is a story about a personal journey of discovery. The 12ers are the nine Idaho peaks that rise above 12,000 feet. Climbing these nine peaks is considered a right of passage for Idaho climbers. 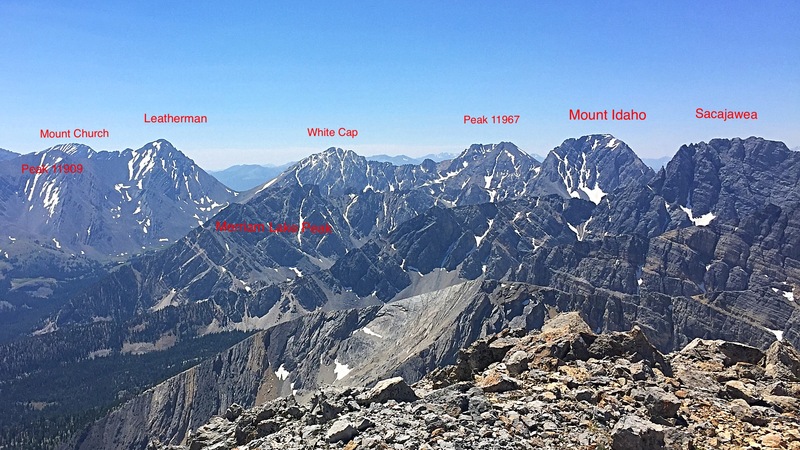 The 12ers include Idaho’s tallest peak, Mount Borah, followed by Leatheman Peak, 12,228; Mount Church, 12,200; Diamond Peak, 12,197; Mount Breitenbach, 12,140; Lost River Mountain, 12,078; Donaldson Peak, 12,023; Mount Idaho, 12,065; and Hyndman Peak, 12,009. The nine peaks are spread across three eastern Idaho mountain ranges, with one each in the Lemhi and Pioneer ranges and seven in the Lost River Range. Climbers quickly discover that there is nothing easy about climbing these peaks. Each of the nine peaks test climbers’ mountaineering skills, their will power, and their conditioning. It takes most climbers several seasons to complete the list. 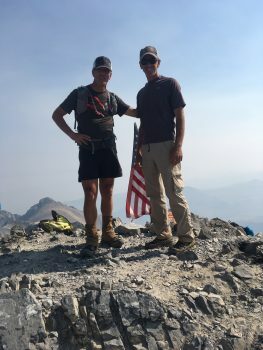 While completing all nine summits places a climber into an impressive and elite group of Idaho peak baggers, climbing all nine peaks in a single push without using a motor vehicle to travel between the three mountain ranges harboring the peaks is an accomplishment beyond the scope of mere mortal climbers. 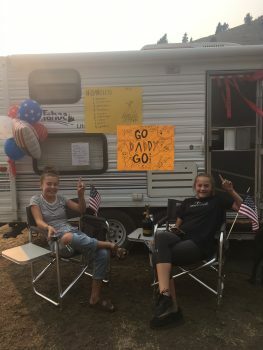 The three fastest times for the 12ers are 1 day, 4 hours, 18 minutes by Luke Nelson of Pocatello and Jared Campbell of Salt Lake City accomplished in 2014 ; 1 day, 13 hours, 44 minutes by Cody Lind of Challis, Brittany Peterson, of Boise and Nate Bender of Missoula accomplished in 2016; and 1 day, 14 hours, 50 minutes by Dave Bingham and Rob Landis of Hailey accomplished in 2006 . All seven of these record holders are impressive athletes and Luke Nelson and Jared Campbell are essentially professional, sponsored endurance runners. They all used vehicles to shuttle between the three mountain ranges and their times are impressive accomplishments. Kelly decided that the next step was to climb all nine peaks foregoing vehicle shuttles. Kelly did it his way . . . Using the standard climbing routes up each peak would require eight separate ascents, as only two of the peaks are situated next to each other. Additionally, climbing each peak separately would significantly add to the overall distance and elevation gain. 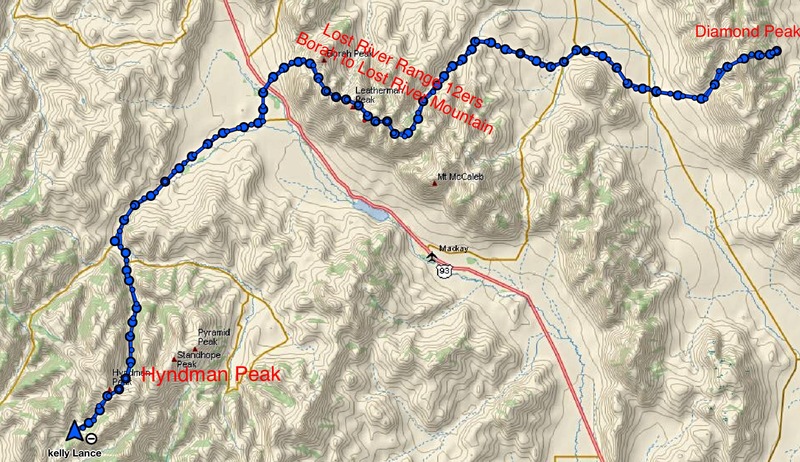 To overcome this problem, Bingham and Landis pioneered a route that linked together the seven Lost River Range 12ers by staying as close as possible to the crest of the Lost River Range between Mount Borah and Lost River Mountain; thereby, minimizing distance and elevation gain and loss. Keep in mind that the concept of minimizing elevation gain and loss are relative concepts in such an undertaking. Further, by attempting to stay as high as possible on the crest, Bingham and Landis and those who followed them had to face many other obstacles like cliffs, steep, loose talus slopes, lack of water, falling rock, and route finding problems. Planning is an essential prerequisite to success. Once the decision was made, Kelly jumped into planning his climb in earnest. Finding the correct route along the crest of the ‪Lost River‬ Range was the crux of the planning stage. 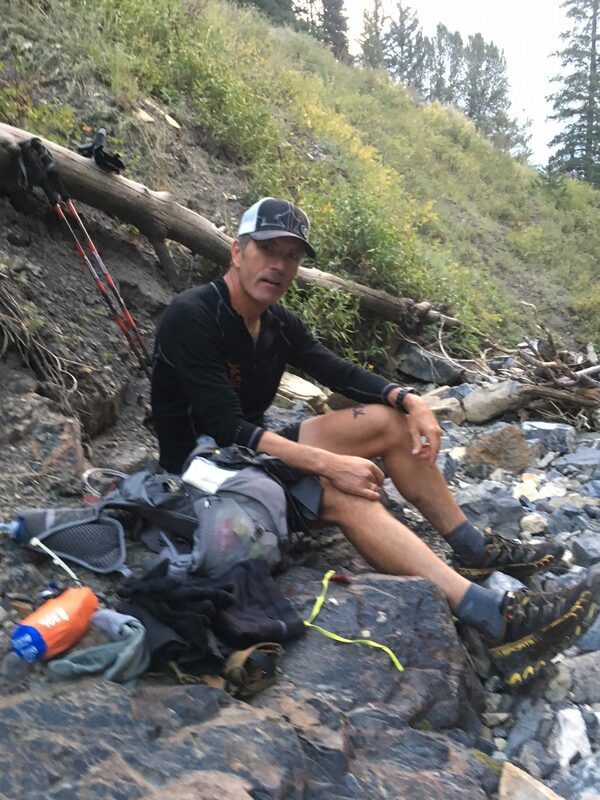 He talked with Jared Campbell about his crossing in 2014 and with Lost River Range expert Wes Collins to get an initial understanding of the route. Most importantly, after tentatively planning a route, he climbed each peak to get a firm handle on the terrain he planned to tie together. While other speed climbers traversed the 12ers from west to east, Kelly’s scouting convinced him the traveling from east to west would be more efficient. 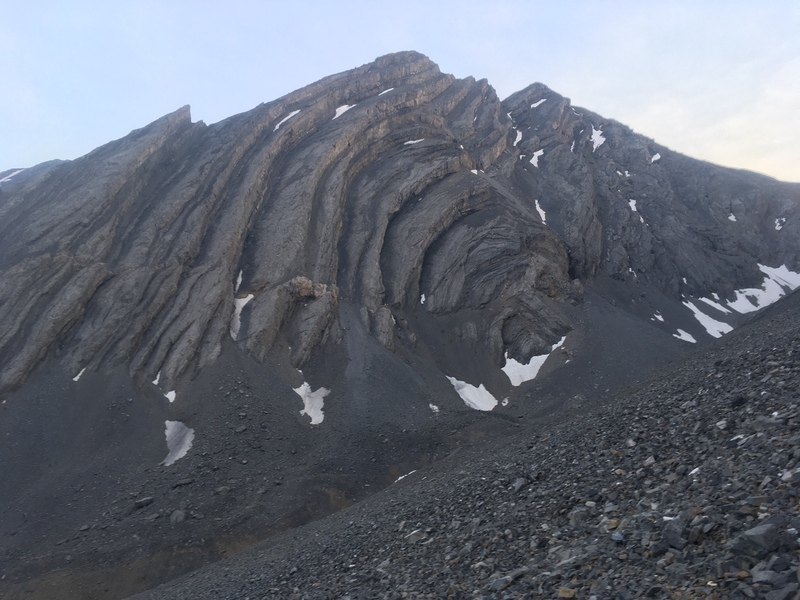 “Primarily, I recognized that to shorten the distance, I needed to traverse the two end peaks [Diamond and Hyndman] rather than following the routes used by the record holders,” Kelly said. Kelly also had to plan the logistics necessary to complete the odyssey. This included what equipment would work best, the amount of food needed to fuel his body, how much water to carry and where and when to rest. 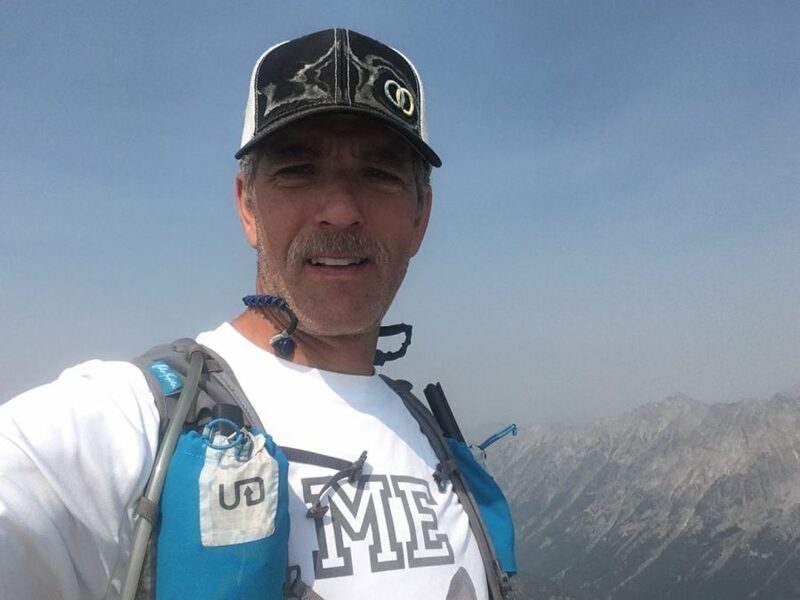 “As an endurance runner with many long races under my belt, I had a good understanding of the logistical requirements but coupling this understanding with the mountaineering aspects required a lot of fine tuning,” according to Kelly. Finally, Kelly lined up a support team he could rely on. His wife, Michelle, and daughters, Charlee and Robbee, were already enthusiastic supporters of the quest. 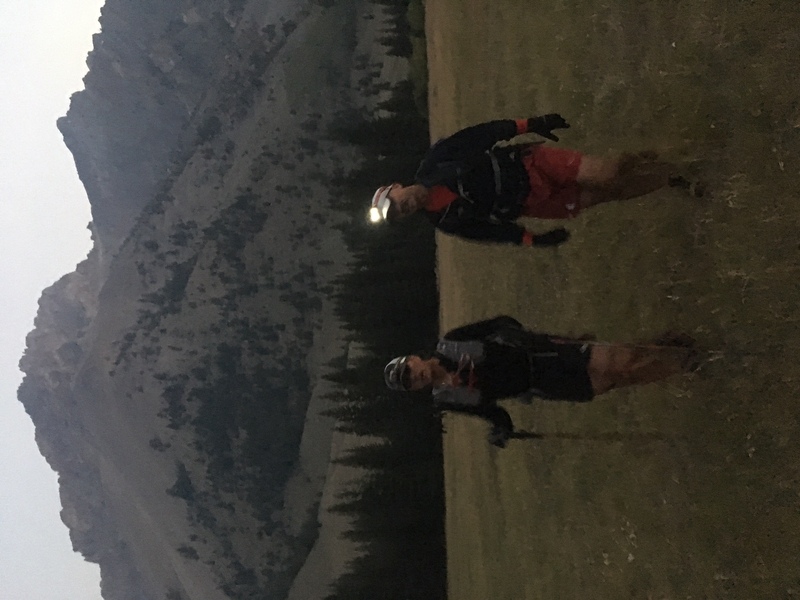 Jack and Connie Oar volunteered to provide additional support after he descended Diamond Peak. Andy and Robyn Holmes and their kids joined the support team and Andy signed up to run with Kelly on a portion of route. 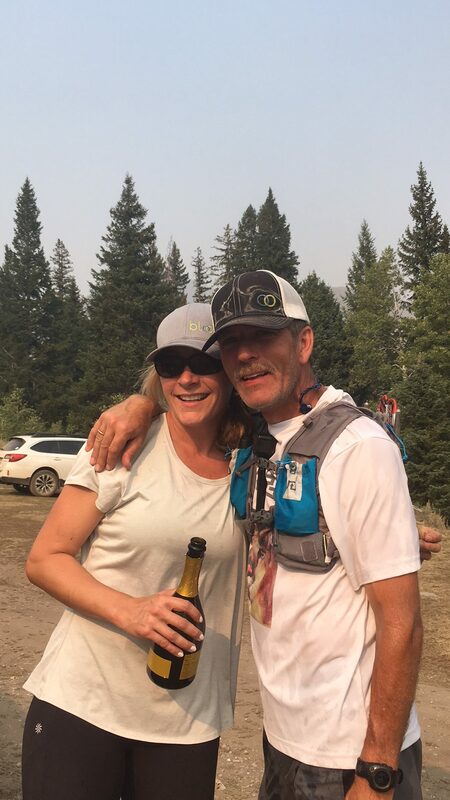 Doug Lawton agreed to meet Kelly at Pass Lake, the midpoint for the second day’s route, and accompany him on his climbs of Mounts Idaho and Borah. So, with two years of planning under his belt and his support crew lined up, Kelly was ready to go. Day One: A Diamond Peak east to west traverse and miles to go before . . .
Diamond Peak is the only 12er in the Lemhi Range. It is most often climbed from the east via a sharp, Class 3 ridge that has significant exposure in places. (Class 3 routes involve actual climbing where your arms and hands are used to propel yourself up the slope.) On September 2, at 10:30 a.m., Kelly said good bye to his family and started up the mountain fresh and feeling strong. After traversing 2.5 miles and gaining 5,100 feet, he reached the summit ‪at 12:50 p.m.‬, still feeling strong. One 12er down, eight to go. Kelly and his family at the Diamond Peak trailhead—119 miles to go. Now, Kelly set out on his descent. He was covering, based on his meticulous recon efforts, familiar country. He descended Diamond’s south ridge toward the saddle between Diamond and the Riddler. It is likely that fewer than a dozen climbers have ever crossed the south ridge. From the saddle his route turned west, dropping down steep slopes toward Badger Creek. It was time for a break and a brief visit with the welcome committee while he ate, cleaned up, and prepared for the next section. From the river, his route continued along the eastern and northern flanks of Hawley Mountain, a large, distinctive peak that projects eastward from the ‪Lost River‬ Range into the valley. Once past Hawley Mountain, his route crossed the broad, high plateau between Wet Creek and Dry Creek. This crossing involved steady but significant elevation gain. Under stress fueling your body is not always easy. Kelly’s body rejects his snack food. Day Two: And now the going gets tough . . . The first peak to be conquered on this day was Lost River Mountain. Kelly planned to ascend a seldom used route that climbs up the peak’s treacherous east face, the Northwest Gully/North Ridge Route, which is rated class 5. In climbing terminology, class 5 means roped climbing with leader placing protection for the safety of both climbers. In other words, the route crosses “technical” rock climbing terrain usually ascended by a team using a rope for protection from falling. The route can be climbed by a solo climber but at greater risk. If this route was the only obstacle he faced that day, “It would have been an easy day,” Kelly thought. 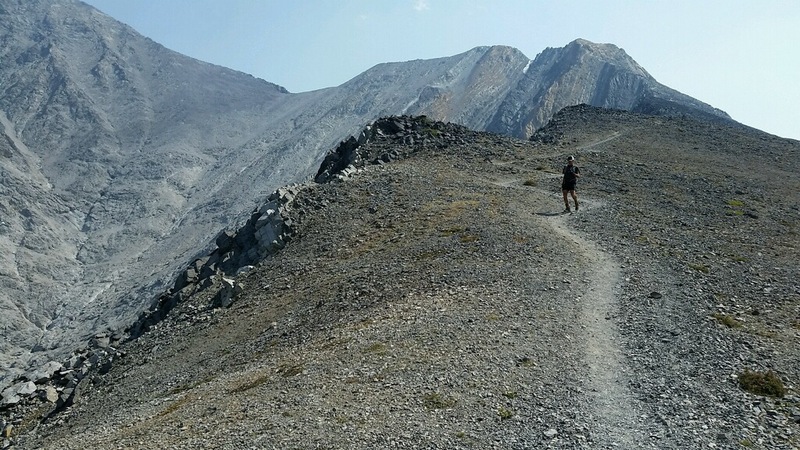 Running toward the Lost River Mountain headwall. A brief rest stop before the climb up Lost River Mountain. After a brief rest, it was time to move on, and he started to descend Lost River peak’s north ridge. Once again, this is not a traditional descent route. But Kelly knew from his recon trips and discussions with both Jared and Wes that staying on or close to the top of the ridge was a feasible route to Mount Breitenbach. 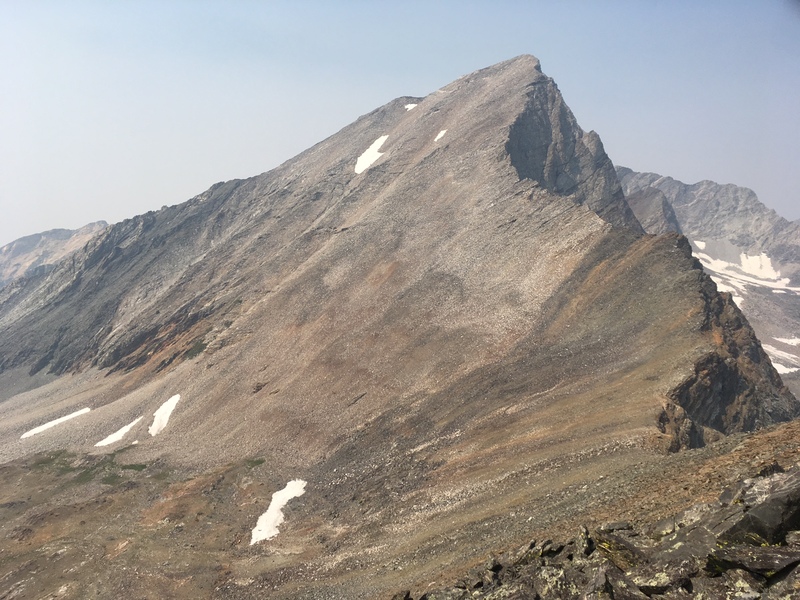 This photo of Mount Breitenbach/Donaldson Peak cirque shows the typical terrain found in the Lost River Range between Lost River Mountain and Mount Borah. The first section of the traverse to Breitenbach took 2.5 hours but was uneventful. Kelly reached the summit ‪around 1:30 p.m.‬ Three 12ers, a third of the peaks were now climbed. Crossing from Breitenbach to Donaldson Peak was a different story, as the ridge top is barred by a series of cliffs and an intermediate peak. 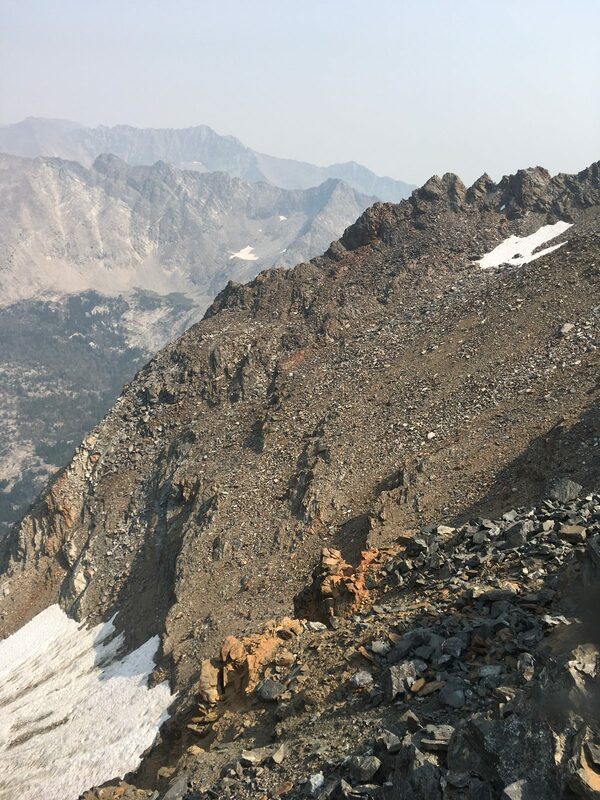 Knowing from his recon efforts that the ridge top was a non-starter, Kelly descended by dropping west off the summit into the rugged and unstable upper Jones Creek cirque. At 10,100 feet, he crossed to Donaldson’s east face and started the steep slog up to the summit. He reached the summit after another three hours, ‪at 4:30 p.m‬. Four 12ers down, and five to go. From Donaldson’s summit, he was on familiar ground as he crossed over the convoluted class 3 ridge to Mount Church. He quickly reached the summit after 45 minutes, ‪at 5:15 p.m.‬ This was the theoretical midpoint of his journey, but in reality the most difficult terrain was still ahead of him. The descent off Mount Church crosses these treacherous ribs. From Mount Church, the Lost River crest leading to Leatherman Peak is blocked by 11,953-foot Bad Rock Peak, a massive pile of broken cliffs, jagged ridges, and towers. In the planning stage, Kelly decided to bypass Bad Rock Peak on its east side. This route took him down Mount Church’s north face. He safely crossed the series of rugged ramps that had worried him as he aimed for an unnamed lake at 9,682 feet. He continued down the drainage past the lake until he could cross over Bad Rock’s northeast ridge. Bad Rock Peak is a difficult peak to climb or circumvent at any time. Imagine facing it as the sun is setting and on no sleep. 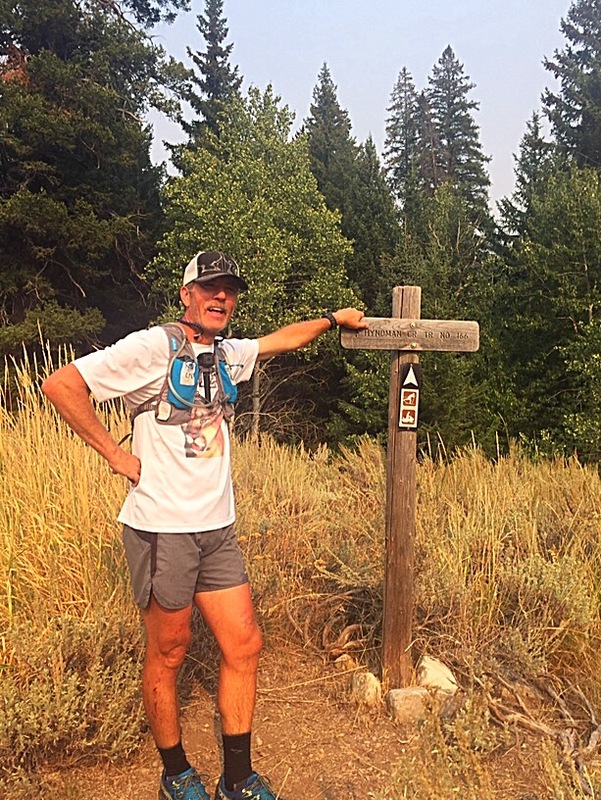 After reaching the bottom of the northeast ridge, he was in the headwaters of the East Fork Pahsimeroi River and had, figuratively, a straight shot up Leatherman Peak, which was due west. However, straight shots in the Lost River Range are never straight in reality. Loose rock, short rocky steps, and massive amounts of elevation gain are always between the climber and his destination. So, all Kelly had to overcome from the point where he now stood was 3,700 feet of elevation gain over unforgiving terrain. The crossing from Mount Church took four hours. He arrived on the summit of Leatherman Peak ‪at 9:15 p.m.‬ He now had completed two thirds of the 12ers with only three to go. 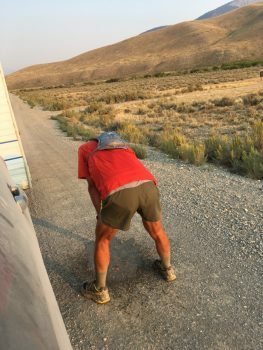 Another way to understand the energy output at this point is to recognize that since he left Dry Creek he had been moving in difficult terrain for 17.5 hours after a short sleepless rest stop and after the prior day’s crossing of Diamond Peak and the Lemhi Range. And now, he had to descend, again losing hard earned elevation. He dropped down Leatherman’s north face while aiming for Pass Lake, which sits in a cirque on the east side of the crest below White Cap Mountain and Peak 11967 at 10,000 feet. Descending after a tough climb and on loose ground is never easy, and now Kelly was descending in the dark. Kelly notes, “In the dark, I didn’t descend far enough before turning west toward the lake and got caught up in a series of ribs and gullies that slowed my progress.” He arrived at the lake ‪at 11:00 p.m.‬, where Doug Lawton was waiting. Sacajawea Peak, a peak that is an even larger obstacle than Bad Rock Peak, stands guard on the Lost River crest between Mount Idaho and Mount Borah. Based on his recon, Kelly recognized that the difficulty posed by Sacajawea’s ragged cliffs was best avoided. 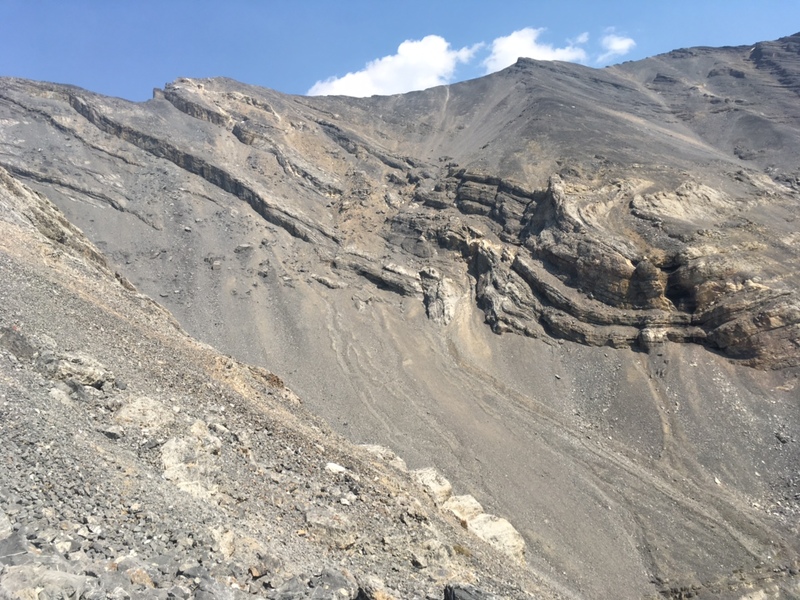 Thus, he chose to drop off the west side of the crest and into the Cedar Creek drainage and traverse completely around the blocking ridge. 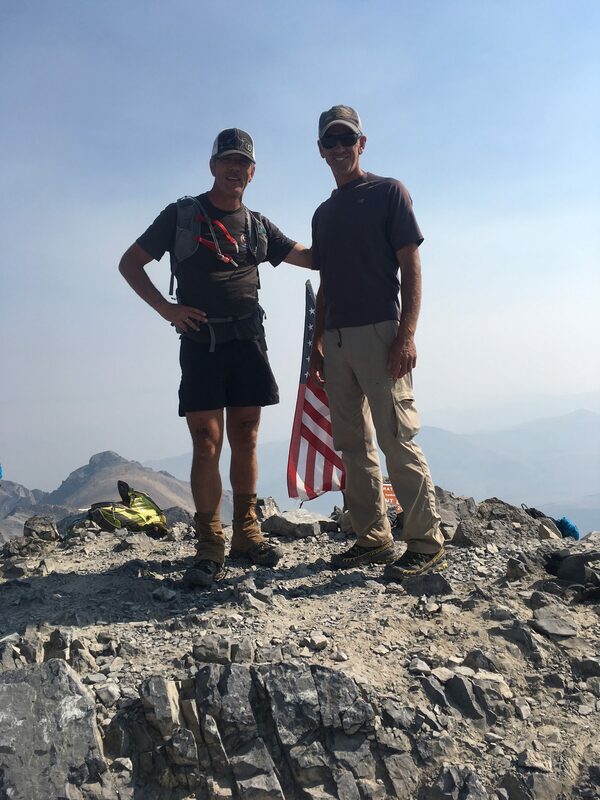 He accomplished this task by descending Idaho’s west ridge to 9,800 feet and then dropped due north to treeline. At dawn, after moving steadily since leaving Dry Creek, he had been on the trail for nearly 27 hours. He stopped and slept for one hour. Kelly and Doug on the Summit of Borah. Kelly descending down the relatively tame Mount Borah climbers trail. Day Three: The end is just over that ridge up ahead . 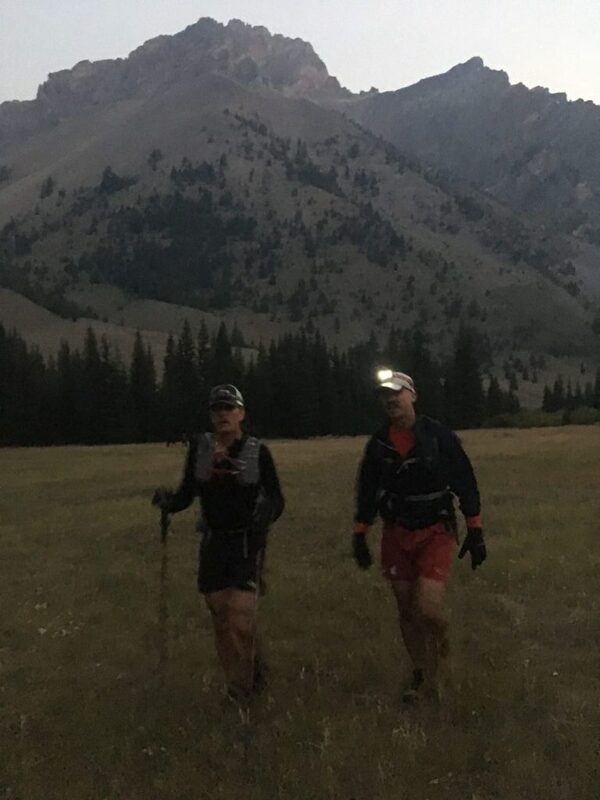 . .
Running toward that big orange moon, Kelly proceed downhill from camp, crossed US-93, and started running up the Big Lost River drainage on the Trail Creek Road to the junction with the Copper Basin Road, still many miles ahead. 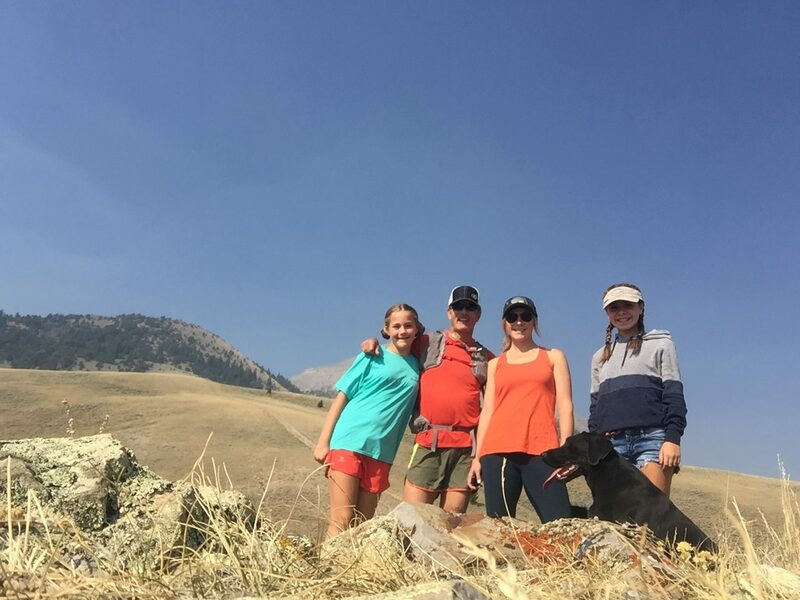 After running since midnight Kelly still had to climb Hyndman Peak. His chosen route climbed up this steep, rotten rib on Old Hyndman Peak . . .
. . . and once he topped out at the base of Old Hyndman’s Summit block he had to turn north and traverse this ridge to Hyndman’s Summit. He still had the descent to the trailhead, but physically in comparison to the distance he had already traveled that would be “relatively” easy. On the summit, Kelly turned on his phone, and text messages immediately flooded his screen with messages of support. “I became pretty emotional,” he remembers, “not so much because of what I had done, but because the messages brought home the overwhelming support I had received over the last two years. It was pretty hard to hold my emotions back. Physically I didn’t feel any pain. 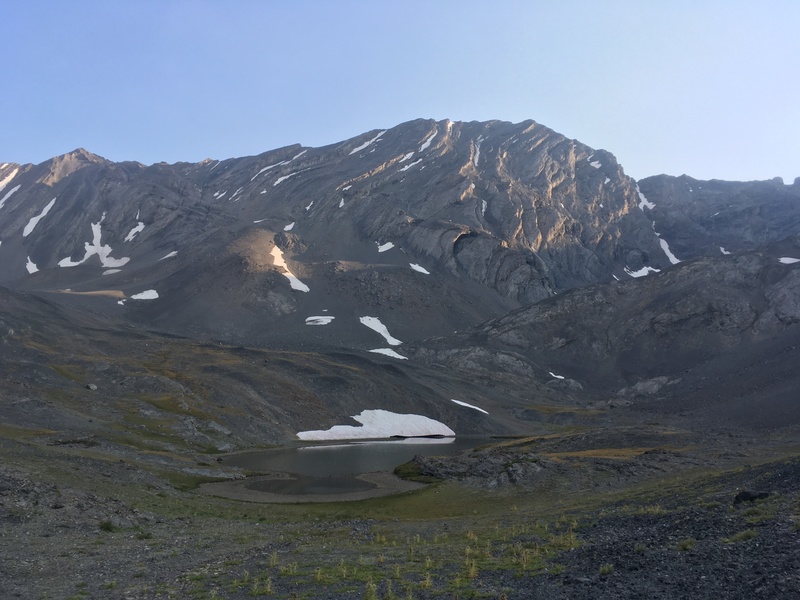 It was my mind that was finally relieved to get a break from the constant concentration that I was putting it through.” Kelly had now climbed all nine 12ers and only had the descent from Hyndman to the trailhead. Of course the trailhead is 5,000 feet lower than the summit, so it was no easy task after already crossing over 100 miles. At journeys end—better spiritually for the wear and tear. Kelly dropped off the mountain heading for the trailhead at an easy pace. 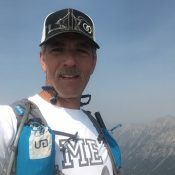 He recalls “I started my descent off hyndman I did stop once to clean my shoes out and ‘soak it all in’, I even slowed a few times to film, but my running pace was strong and I really didn’t try to hold back.” Nearing the trailhead, he let out a few yells and was promptly answered back. Then it was over. “I was greeted by my daughters, wife, and dogs. I had to make sure to touch the trailhead sign. 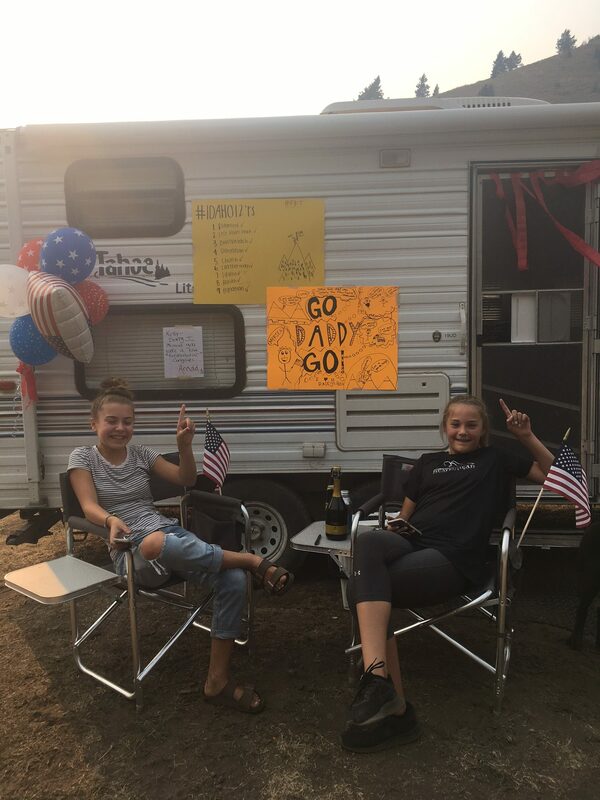 They had decorated the trailer with signs and flags. Michelle sprayed me with champagne. They all made it very special.” He arrived at the trail head ‪at 4:35 pm‬. No Man Walks Alone . . .
· Day One: 32.1 miles; 6,522 feet of elevation gain. · Day Two: 42 miles; 20,640 feet of elevation gain. · Day Three: 44.9 miles; 6,603 feet of elevation gain. Kelly, Michelle and champagne—it’s party time? · Pack: Osprey duro 15 pack. Fuel: 3.5 liters of water, jerky and gels. · Clothes: Black Diamond gloves, Dry Max overcalf hiking socks, La Sportiva Ultra Raptor shoes, Gaiters–Wool First Lite. · Poles: Black Diamond Carbon Mountain poles. · Pack: Ultimate direction Anton Krupicka pack. · Fuel: sandwich, chips and a Coke at first rest stop. Changed shoes and socks. gels and trail mix. Chicken and rice soup at second rest stop (vomited shortly thereafter). Coke (note ensure when done for the day) and mashed potatoes. Day Two: Dry Creek to Borah Trailhead. · Pack and Misc. Gear: Osprey pack, two headlamps, emergency kit with lighter, first aid supply, and bivy sack, Aqua Mira water filter and a knife. · Clothes: Wool gaiters. Outdoor Research rain jacket, wool T-shirt, wool long sleeve shirt, down puffy, Black Diamond gloves. · Fuel: Eggs, cheese, and banana with coffee for breakfast. 4 L of water, Nuun electrolyte, Perpetuem drink by Hammer Nutrition. Two wraps with cheese and salami in flour tortilla, 30 gels, tuna fish, jerky, trail mix, couple candy bars. Day Three: Trail Creek Road to Hyndman Peak to the Hyndman Creek trailhead. · Fuel: Several gels, eggs, and cheese at first rest stop, chicken sandwich, jerky. Coke at finish and ribeye steak and potatoes for dinner a couple hours later, with a beer.